My original idea was to write one blog about both Truss’s book and Noah Lukeman’s A Dash of Style: The Art and Mastery of Punctuation , but there’s too much to say about both of these amazing punctuation books to cram in here. And while you might be thanking me for not subjecting you to such a long post, please don’t hate me for what I’m about to do. Lukeman never addresses apostrophes in his book, and I can only assume it’s because A Dash of Style is about, well, style, and apostrophes aren’t things that should be thrown around like optional commas – although that doesn’t stop people from trying. (I actually do know of one stylistic apostrophe choice, but I’ll get to that later.) Lynne Truss, on the other hand, has such a wonderful chapter devoted to the oft misused and abused apostrophe that I decided it could use a post all to itself. What did I do to deserve this? you might be thinking, but I promise that what Truss has to say on the subject is both humorous and informative, thus worth the read. The apostrophe (like the hyphen) is one of those few punctuation marks that is necessary when we learn how to spell; we simply couldn’t (or shouldn’t) write many of our words without it. Some people, when confused, might throw a comma in “men,s restroom,” for example, which is utter nonsense. Commas don’t go in words. Ever. But the person writing “men,s” knows that something needs to happen. “Mens restroom” just looks empty. 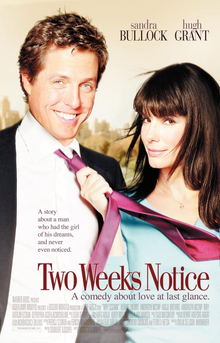 Truss’s favorite example, which she uses throughout the book as an indication of how far our society has slipped in proper punctuation usage, is the movie Two Weeks Notice. This is incorrect. It should be Two Weeks’ Notice. I was born in the spring of ’83. Not too difficult to grasp. Remember how I said there’s a stylistic use for apostrophes? That’s where this one comes in, and I’ll elaborate later. Okay, that one is just obvious. You don’t get straight As, you get straight A’s. This rule, in my opinion, is there to indicate how to pronounce what you’re reading. While I don’t think you would confuse Bs and B’s, my example above shows that with vowels, the pronunciation could vary and change the meaning (or obscure the meaning, anyway), so it’s best to stay consistent. The English language first picked up the apostrophe in the 16th century. The word in Greek means “turning away”, and hence “omission” or “elision”. In classical texts, it was used to mark dropped letters, as in t’cius for “tertius”; and when English printers adopted it, this was still its only function. It picked up more tasks over the centuries, as the above rules show. Perhaps it is because the little mark is expected to do so much that it is so often confused with other marks or omitted altogether. As for the stylistic use of the apostrophe that I’ve mentioned, I’ve read books by well-established authors in which apostrophes are omitted in dialogue when the people speaking drop letters at the end of words (such as “g”). Say Joe Character has a strong Southern drawl and not the best grammar. For instance, “I was going to the park the other day, walking the dog, minding my own business, when this kid on a skateboard came out of nowhere and almost ran me over.” Written like this, it’s difficult hear the accent. So let’s try: “I was goin’ to the park th’other day, walkin’ the dog, mindin’ m’own business, when this kid on a skateboard come out of nowhere and almost run me over.” The authors who choose to stylistically drop apostrophes would not place them in the words with the missing g’s. I don’t know why, exactly. Maybe the apostrophe’s presence looks a little too formal for someone who’s speaking improperly. Either way, as long as we can all still tell what the words are supposed to be without the apostrophes, it’s an okay choice to make (although I’m too much of a stickler to do it myself). The other time authors might do this is if a first person narrator has an accent and narrates as such throughout a story. Here, though, I must warn against giving characters too much of an accent. They often require words that are misspelled to match their mis-pronunciations, and that can end up sounding affected and fake. J.K. Rowling did a great job with Hagrid in her Harry Potter books, but if you’ve ever tried to decipher George Bernard Shaw’s Pygmalion without help, you might never be able to get past the first few pages. Did I make myself pretty clear, or are you more confused than when you started? I hope that I’ve encouraged rather than discouraged you. Be vigilant about your punctuation because it matters! And, of course, Lynne Truss has much more to say about the matter in Eat, Shoots, & Leaves, which I hope you will pick up. And since she inspired this post, I will let her have the last word. 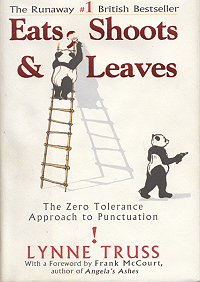 This entry was posted in Book Reviews, Writing and tagged A Dash of Style, Apostrophe, Eats Shoots & Leaves, English Language, Lynne Truss, Noah Lukeman, Punctuation, Writing. Twain used the apostrophe pretty well in his dialogues too.